What is 5 CHOOSE 3 or 5C3? 5 CHOOSE 3 = 10 possible combinations. 10 is the total number of all possible combinations for choosing 3 elements at a time from 5 distinct elements without considering the order of elements in statistics & probability surveys or experiments. 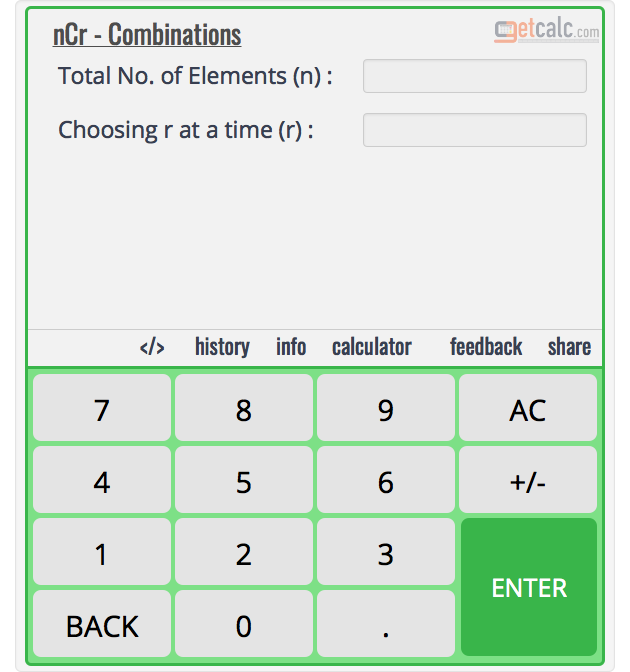 The number of combinations for sample space 5 CHOOSE 3 can also be written as 5C3 in the format of nCr or nCk. How to Find 5C3 or 5 CHOOSE 3? The below is the complete work with step by step calculation for 5 CHOOSE 3 may helpful for grade school students to learn how find all possible combinations of 5C3 for sample space S in the statistical experiment or to solve the combinations worksheet problems by just changing the corresponding input values of this 5 CHOOSE 3 calculator. Find what is 5 CHOOSE 3? nCk = n!/k! (n - k)! 5 CHOOSE 3 =5!/3! (5 - 3)! step 3 Find the factorial for 5!, 3! & 2!, substitute the corresponding values in the below expression and simplify. work with steps for 4 CHOOSE 2? work with steps for 4 CHOOSE 3? work with steps for 4 CHOOSE 4? work with steps for 5 CHOOSE 2? work with steps for 5 CHOOSE 4? work with steps for 6 CHOOSE 2?